Wall Street faces a crisis that touches the very core of its largely male workforce. 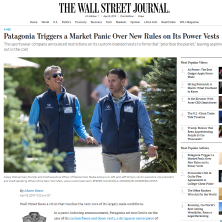 In a panic-inducing announcement, Patagonia set new limits on the sale of its custom fleece and down vests, a de rigueur centerpiece of the modern three-piece suit. On weekdays, foot soldiers in New York City’s business-and-finance army parade through Manhattan wearing Patagonia vests embroidered with such names as JPMorgan Chase , Nomura and BMO Capital. Like a pair of $1,500 John Lobb oxfords, these co-branded power vests can intimidate and draw envy. Hedge funds, private-equity firms, banks and startups seeking permission to start ordering the employee perquisite must persuade Patagonia they are helping turn America green—and not just by making money. The policy applies only to firms that have never placed orders for the outdoorsy fashion frill. “I’ll die on a hill with it,” said Michael Antonelli, market strategist at investment bank Robert W. Baird & Co., describing his attachment to his own customized Patagonia vest. The fashion may have first appeared on trading room floors, he said, where South Pole temperatures are better suited for computers rather than people. The vests are largely a male business-wear accessory. Women have little demand for what’s essentially an armless sweater to wear over an outfit, said Nancy Tengler, chief investment strategist at Tengler Wealth Management in Phoenix. “I wouldn’t be caught dead wearing one over my dress,” she said, even if Arizona temperatures warranted it.